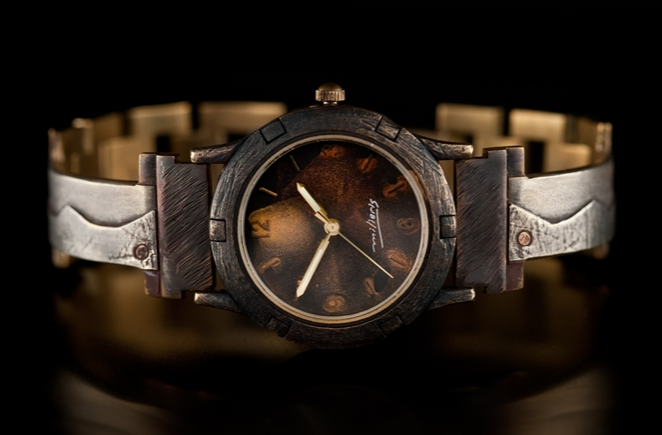 The PNW33 watch has a hand-painted dial in a distressed and oxidized large round brass case. The narrow brass band has a sterling silver trim overlap with a silver wave design. Every watch is hand sculpted and painted individually, so each has its own unique variation. This is a Limited Edition; each watch is numbered and signed by Eduardo Milieris. We have the tools and materials to adjust the size of this piece. Please include wrist size when ordering.